Getting enough protein from your diet is essential and foods such as chicken, fish and eggs are a good source of protein. If you’re vegan however, you’ll have removed meat, fish and dairy products from your diet. If your diet’s lacking, there’s a simple solution in order to get your daily intake of protein; you can use a vegan protein powder. I have a number of friends who are vegan and most of them use supplements on a daily basis. Some of them take vitamin supplements and the people who work out all use protein powders. Most of them say they benefit from taking the protein powders and their energy levels are increased. Adds protein and vitamins and amino acids. Who Needs to Use Vegan Protein Powder? You can use vegan protein powder to increase the levels of protein in your body if you don’t eat meat, fish or dairy products. You can also use protein powders when you’re trying to build muscle mass when working out. It’s important to monitor your protein intake to ensure you’re not getting too much. Even if you’re not vegan you can use vegan protein powders to supplement your diet. Many people who do eat meat, fish and dairy products don’t get adequate amounts of protein. The recommended dietary allowance (RDA) for protein is 0.8 grams per kilogram of bodyweight per day. How Does Vegan Protein Powder Work? Vegan protein powders help the body to produce amino acids to build healthy muscle mass. If you’re trying to bulk up it’s important that you get enough protein to build up your muscles. The amino acids also help muscles to repair following a muscular strain or tear. Most of the vegan protein powders are mixed with water or a fruit smoothie which makes them drinkable. Consuming the protein in the form of a drink makes it easier for the body to digest. How Do I Choose Vegan Protein Powder? Before you buy your vegan protein powder you should look at the ingredients used to make the product. Checking the list of ingredients is particularly important of you have allergies or intolerances. Many of the protein powders are made from natural ingredients but some contain additives and fillers. Use a vegan protein powder that’s easy to mix so it’s pleasant to drink. If the powder doesn’t mix it may be lumpy or it may have a powdery taste which can be unpleasant. Some of the powders do have a chalky consistency due to the nature of the ingredients. If you take other supplements you should look for a protein powder that’s an all-in-one supplement. Having an all-in-one supplement will save you time and money. It’ll also be more convenient as you won’t have to take capsules or mix multiple drinks each day. Use protein powder that’s easy to mix. We’ve looked at a range of protein powders and selected five that are suitable for vegans. The main points we looked at were quality, price, quantity in each tub and the amount of protein per serving. We’ve reviewed five vegan protein powders and highlighted some pros and cons for each product. 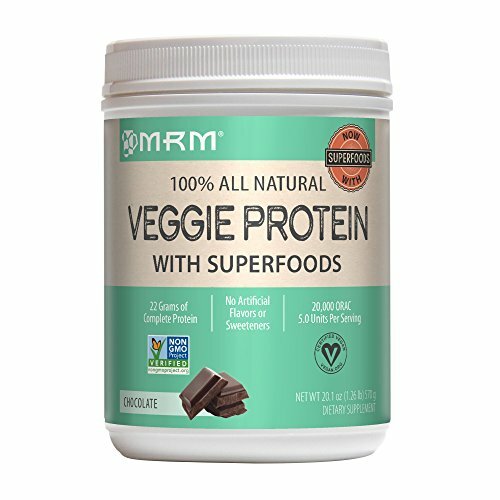 This veggie protein powder made by MRM is made with a blend of natural ingredients and is sold in 20-ounce packs. The protein powder is available in four flavors and is suitable for vegans and vegetarians. The powder gives you 22 grams of protein per serving and contains enzymes to help with digestion. People who purchased this protein powder like the taste and were impressed with the range of flavors. Customers said the protein powder is easy to digest and it satisfies their appetite between meals. A number of customers also said they were happy with the price of the powder compared to other products. Some customers who used this protein powder said that it has a powdery consistency when mixed as a drink. A few people said that when they mix the protein powder with a smoothie it’s too sweet. Customers also commented that the powder doesn’t dissolve properly when mixed with water. 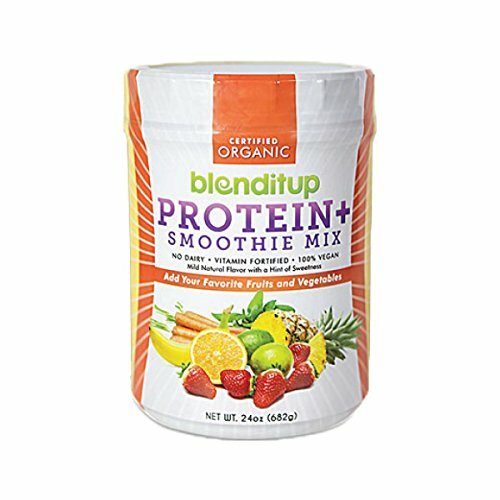 This vegan protein powder made by BlendItUp is an organic supplement available in 24-ounce packs. The protein powder adds protein to your diet along with a blend of vitamins and amino acids. The powder contains no sugar or artificial sweeteners and delivers 14 grams of protein per serving. Customers who purchased this protein powder said it’s easy to blend and doesn’t over power fruit and vegetables when making a smoothie. People said that the powder is effective and helps them to maintain a healthy bodyweight. Customers also like the fact that the protein powder is made with organic ingredients. 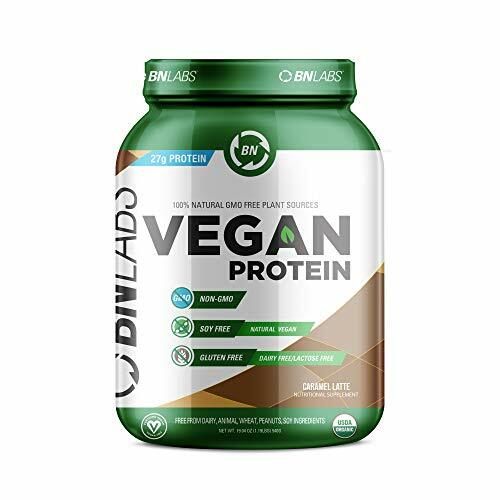 Customers who used this vegan protein powder said it has an unpleasant taste and it also leaves an aftertaste. A number of people said that when the powder is mixed into a smoothie it has a chalky texture. A couple of customers also reported side effects including headaches and hot flashes. The BN Labs vegan protein powder is made from organic ingredients and each tub contains 41 ounces. The powder is dairy, soy and lactose free and there’s no added sugar or artificial ingredients. The supplement is suitable for vegans and each serving provides 28 grams of protein. A number of people who purchased this vegan protein powder said that their energy levels have increased after using it. Customers also said the protein powder is reasonably priced and better than some of the costlier alternatives. Customers also like the fact that this protein powder is made with organic ingredients. Customers who used this vegan protein powder said that it’s hard to mix and doesn’t dissolve easily. A few customers said that after taking the protein powder they suffered with stomach ache. People also commented they didn’t like the taste of the drink and it was a little gritty. 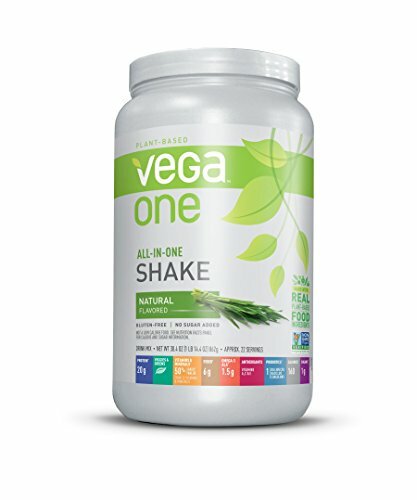 Vega one is an all-in-one shake made from organic ingredients and each tub contains 30 ounces of protein powder. As well as protein the shake contains vitamins, mineral, fiber and omega-3. The dairy-free shakes are suitable for vegans and a serving will give you 20 grams of protein. Customers who purchased this all-in-one protein shake said that it tastes good and gives them an energy boost. A number of customers said that the shakes fill them up when used as a meal replacement. Customers also liked the fact that they get other vitamins, probiotics and minerals from the shake. Some users said the drink is too sweet and it leaves an aftertaste. People also said when they opened the tub the powder had an unpleasant odour. A number of customers reported that when they mix the shake it has a gritty and chalky consistency. 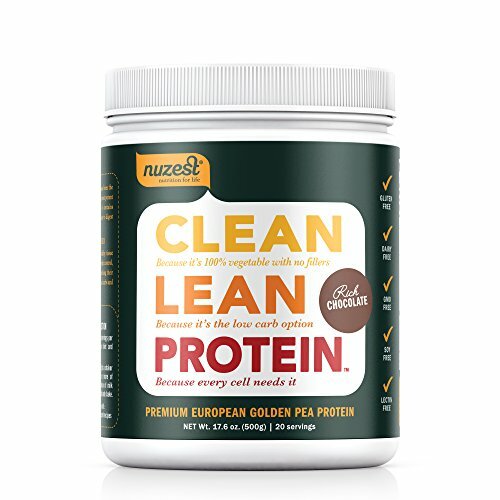 Clean lean protein made by NuZest is sold in tubs that contain 17.6 ounces of powder and it’s available in five flavors. The powder is made with vegetable proteins suitable for vegans and vegetarians. The protein powder contains no added sugar and each serving provides around 20 grams of protein. Customers who purchased this protein powder were impressed with the range of flavors that are available. People said that the protein powder drinks are filling and very easy to digest. A number of customers also said the the protein powder mixes well with fruits and smoothies. Some customers who used this protein powder said it leaves a bad aftertaste which lingers for a long time. A couple of people said that even though they mixed the powder well the drink was too thick. A number of customers also said that the powder didn’t taste as good as other protein powders they’d used. Mixes well with other ingredients. All the protein powders we’ve reviewed are suitable for vegans and they’re all easy to prepare. None of these protein powders contain any harmful additives and are all safe to drink. The protein powders cover a range of prices and they all deliver adequate amounts of protein. After looking at all the products the best vegan protein powder is the MRM Veggie Protein Powder. This reasonably priced protein powder tastes good and is easy to digest due to the added enzymes. We were also impressed with the choice of flavors and we like the fact that the protein powder is made from natural ingredients. 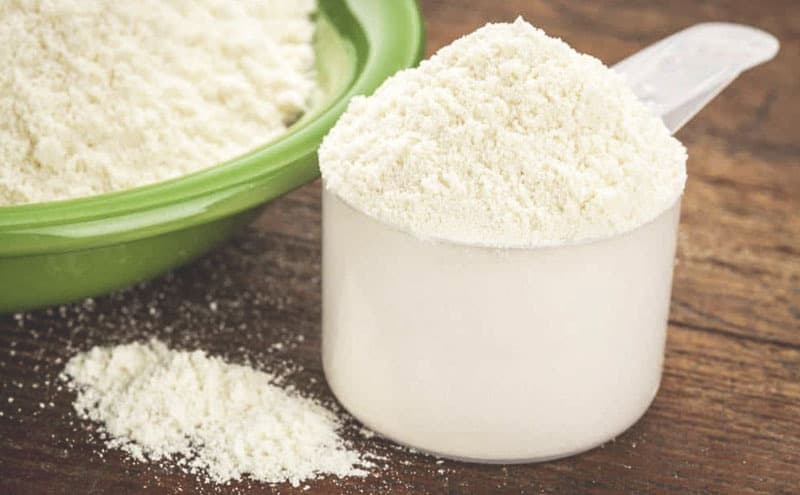 Creatine vs Whey Protein: What’s The Difference & Which is Better? What Is the Best Protein Powder For Lactose Intolerant People?